namecheap affiliate program is one of the best webhosting companies in the world, and what amazes me most is their affiliate program. Do you want to make money from webhosting companies? If yes, then namecheap affiliate program is definitely one of the best and easy way. I would be explaining in details how this Namecheap affiliate program and how you can leverage it and make huge money by engaging in affiliate program. Just to prove to you that this program is worth promoting on your blog or website, here is detailed information of namecheap affiliate program. Namecheap webhosting and domain registrar is a well known and all known to be one of the best and reliable webhosting companies right now on the internet. Namecheap, Inc. Is an ICANN accredited registrar, which renders service on webhosting and domain name registration, and offer for sale domain names that are registered to third parties. This company based in Phoenix, Arizona. While you don't really need this information, it'd do a whole lot of good to know about this awesome webhosting company before you start promoting it with visitors on your blog or website. With such a trusted webhosting company, you are opportune to promote them and make some cool commission. This is the third affiliate program am sharing here on this blog that actually earns you huge money even for sales of its domain. Ofcourse many webhosting company only pay you for hosting purchases. But it is so with Namecheap affiliate program. Am going to show you the easiest way to do it in few minutes. How to make money with Namecheap affiliate program. •offer you some % commission for making out time to promote their products. Having known this you may be asking "Okejiri, how do i get started right away?" 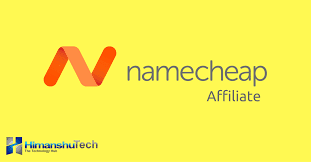 For sure in every business, you need you need to work hard to make it big however let me show you how much you can earn from namecheap affiliate program. Back then when namecheap affiliate program was launched, they have a system which is now outdated as the new system is live. •15% for whoever you refer to namecheap through your link. This applies to domain, webhosting etc. Well i guesse the commission was kinda low compared to other affiliate programs and as well affiliate Link tracking issues. The new Namecheap affiliate system is very good and live. My blog here is hosted on Namecheap and as a customer or an affiliate of Namecheap i get regular emails concerning the site. Recently i received mail from Namecheap concerning the new affiliate system. This new system is now connected to the world leading affiliate platform that connect publishers (you) with advertisers (Namecheap). Now you can make your calculation and know how much commission you can earn from this awesome Namecheap affiliate program. How to Apply for Namecheap affiliate program. The registration involves few steps. I will break it down for you. It's very easy, even a complete newbie can signup for Namecheap affiliate program and start earning right away. 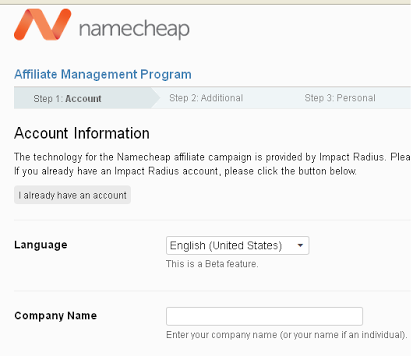 Just as said earlier, impact radius is an affiliate management platform. When you register for impact radius you will not only promote Namecheap but as well lots of other webhosting companies such as hostgator. This is the best platform for managing affiliate and they keep correct track of your clicks and conversion. So the first step is signup for impact radius. If you already have an account with impact radius, you should click on the already have an account link on the website. step 2 : Apply for Namecheap affiliate program. If you follow the Link above impact radius will take you through the application. Fill in your correct details. Accept the terms and conditions and you just applied to the program. Within 24hours, you will get the approval email from Namecheap welcoming you into their awesome affiliate program. Now that you have successfully applied what next?. You have applied, been approved and and the next question is 'how do i effectively promote and make money?. First you need to login to your impact radius dashboard and there you have a range of banners to put on your blog as well as the general affiliate Link. 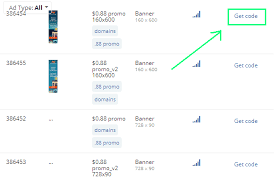 Just look up any banner of your choice and click on the get code. Ofcourse you are not working for free. You need to withdraw your commission ones it reaches threshold. Important thing you need to know about this Namecheap affiliate program. I had a live chat with the Namecheap support and here are thing you should know about the affiliate program. •The customer may not have register using your affiliate but must use your link to order their first product on Namecheap. If he or she has registered long ago and have purchased a product already. Then using your affiliate link is useless and it will not earn you any commission. Now you know why that the Namecheap affiliate program can earn you much commission if you follow the steps properly and accordingly. If you read this post , i will advice you not to just read, but read and take action. That's the best way to make it work well for you. Namecheap affiliate program is very good if only you can buckle up your shoes and especially do as i said. If you have any question? Drop them in the comment section and i will reply as soon as i can. Don't forget to share with friends on social media and have a great time. Hello there, You have done an incredible job. I'll certainly digg it and for my part recommend to my friends. Further SSL stands for protected socket layer. VeriSign certificates can be more pricey than others.